The main difference between volatile and nonvolatile memory is that the volatile memory requires a continuous power supply to retain data while nonvolatile memory does not require a continuous power supply to retain data. Memory is an important component in a computer. 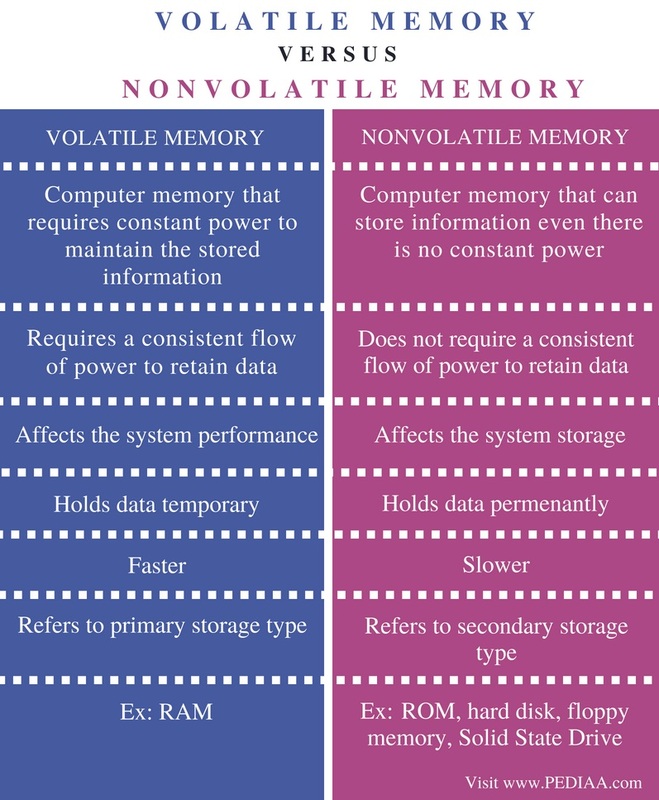 There are two types of memory called volatile and nonvolatile memory. Volatile memory requires a consistent power flow to hold data. Thus, the content is deleted when the power is interrupted. Therefore, volatile memory stores data temporarily. Moreover, it refers to primary storage such as RAM. On the other hand, nonvolatile memory refers to secondary storage devices. This type of memory does not require a consistent flow of power to hold data. In other words, interruption in power will not delete the content in nonvolatile memory. Volatile memory requires a continuous flow of power to hold data. Therefore, it will retain data as long as there is power. If there is a power failure, the stored data in the volatile memory is erased. Main memory or RAM uses volatile memory. There are two types of RAM called Static RAM (SRAM) and Dynamic RAM (DRAM). SRAM is a semiconductor memory. It uses flip flops to store data. It is a fast memory. SRAM is frequently used for the cache to access data within a minimum amount of time. It is also used for routers, peripheral devices, and register files. DRAM is a semiconductor memory. It stores data in a separate capacitor with an integrated circuit. The charging and discharging of the capacitor represents the logical one or logical zero. There is a leakage in current because of the capacitor. It can result in data loss. Therefore, DRAM requires continuous refresh cycles to hold data. DRAM is not faster than DRAM, but it is faster than the secondary storage devices. The nonvolatile memory stores data even there is no continuous power flow. It will retain data even there is a power failure. In other words, the data in nonvolatile memory is permanent. ROM, hard disk drives are some examples for nonvolatile memory. ROM stands for Read Only Memory. It contains the instructions necessary to start the computer. It is only possible to read from ROM, and it is not possible to do write operations to the ROM. 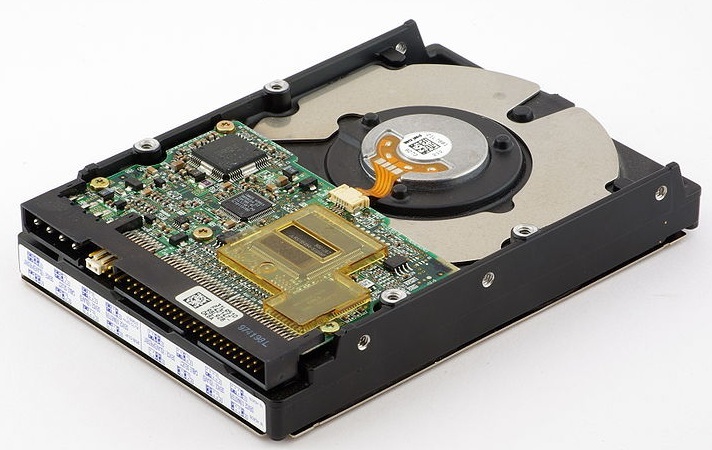 The hard drive is another component that has nonvolatile memory. It consists of one or more rigid rotating devices called platters coated with magnetic material. These platters are arranged on a moving actuator arm. The arm reads and writes data to the platter surfaces. It is possible to read and write sequentially as well as in a non-contiguous manner. Volatile memory is computer memory that requires constant power to maintain the stored information. Nonvolatile memory is a type of computer memory that can store information even there is no constant power. The volatile memory requires a consistent flow of power to retain data while the nonvolatile memory does not require a consistent flow of power to retain data. Volatile memory affects the system performance. Nonvolatile memory affects the system storage. The volatile memory holds data temporary while nonvolatile memory holds data permanently. The volatile memory is faster than nonvolatile memory. Volatile memory refers to primary storage type while nonvolatile memory refers to secondary storage type. 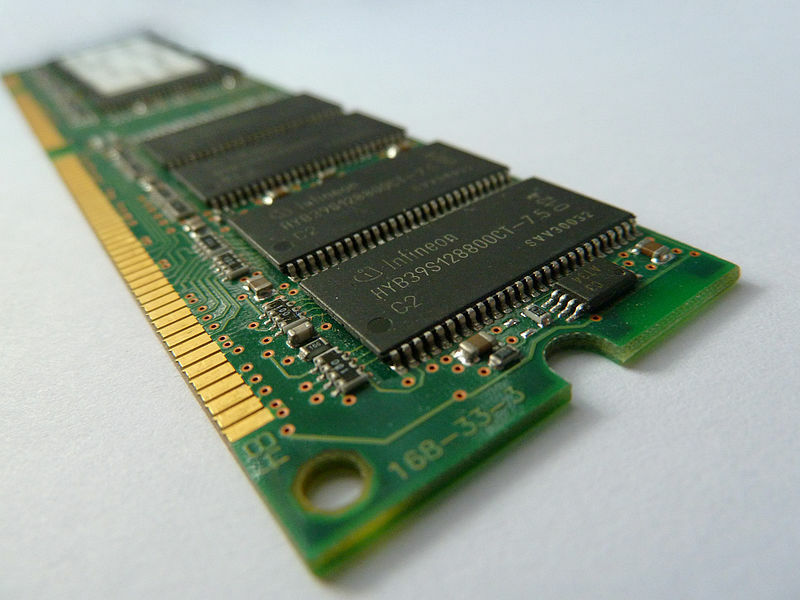 RAM is an example of volatile memory. ROM, hard disk, floppy memory, Solid State Drive are some examples for nonvolatile memory. The difference between volatile and nonvolatile memory is that the volatile memory requires a continuous power supply to retain data while the nonvolatile memory does not require a continuous power supply to retain data. Usually, the volatile memory is faster than nonvolatile memory. 1. “Volatile Memory.” Wikipedia, Wikimedia Foundation, 26 July 2018, Available here. 2. “Non-Volatile Memory.” Wikipedia, Wikimedia Foundation, 27 July 2018, Available here. 3. “What Is a Hard Drive?” Computer Hope, 1 Apr. 2018, Available here.